Porterhouse Steaks with Basil-Rocket Pesto, from Weber’s Greatest Hits. In 1952, George Stephen invented the Weber kettle barbecue while working for Chicago company, Weber Brothers Metal Works. The company was soon inundated with requests for recipes and cooking instructions, so along with family and friends, George put out a small cookbook that sold for 50 cents. Over the years since, the company has produced millions of cookbooks that have been translated into 10 languages. The best of all these recipes have now been brought together in Weber’s Greatest Hits, published by Murdoch Books. Jamie Purviance was given the task of making a selection from the 2,500 recipes published over the years. Cookbook owners and Weber employees were polled, along with chefs from the company’s restaurants and barbecue academies. Comments from Weber users about recipes such as Zesty Garlic Prawns, and Corn on the Cob with Basil-Parmesan Butter, had made it clear that simplicity often mattered as much as taste. Recipes such as Ginger T-Bone Steaks with Roasted Sesame Salt, Charred Asparagus with Basil-Lime Dipping Sauce, and Chilli-Rubbed Chicken with Apple, Avocado and Orange Salsa, were appreciated for being “unique without being weird”. They are featured along with pepper-crusted rib roasts, juicy prawns, spice-rubbed chickens and a fabulous cedar-planked salmon, as well as salads and even a grilled pineapple cake. Destined to become the bible of barbecuing, Weber’s Greatest Hits invites you to season your meat, grab your tongs, fire up the barbecue and get cooking. In a food processor, combine the rocket, basil, walnuts, lemon zest and garlic, and pulse until coarsely chopped. With the machine running, gradually add the oil and process until well blended. Season the pesto with salt and pepper, and set aside. Lightly brush the steaks on both sides with oil and then season on both sides with salt and pepper. Allow the steaks to stand at room temperature for 15 to 30 minutes before barbecuing. Prepare the barbecue for direct cooking over high heat, 230 to 290°C (450 to 550°F). Brush the cooking grills clean. Barbecue the steaks over direct high heat, with the lid closed, until cooked to your desired doneness (6 to 8 minutes for medium rare), turning once. Remove the steaks from the barbecue and allow to rest for 3 to 5 minutes. 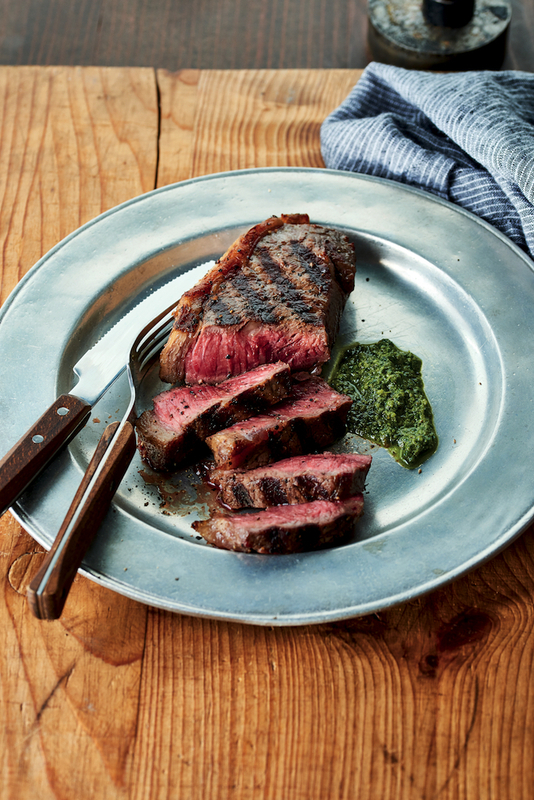 Top each steak with a generous dollop of the pesto and serve warm. 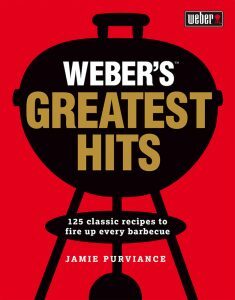 Recipe and images from Weber’s Greatest Hits, by Jamie Purviance. Photography by Ray Kachatorian. Published by Murdoch Books and reproduced with the publisher’s permission. Friday Food Tip: a lovely tapas dish.